Days that are booked are displayed in blue. Rates from $1000 – $1800 per night. Minimum stay three nights (ten nights in peak season). Please contact us for best available rates. Please visit our sister villa, Raku. Celadon is 25 minutes from the airport and is located in the Maenam district of Samui. Recent testimonials from Celadon guests. Thank you so much!! We truly enjoyed your beautiful villa and we were so relaxed after a week in the atmosphere. EVERYTHING was above expectations including Bee´s food. We used the pool a lot! We are amazed of how you managed to create such a beautiful and modern paradise on top of that steep hill. We also enjoyed most of your recommended restaurants (incl W Hotel! ), the snorkelling tour to Koh Tao and the elephant ride by the waterfall. We will most certainly check with you next time we plan to go to Thailand..to see if the villa is available. 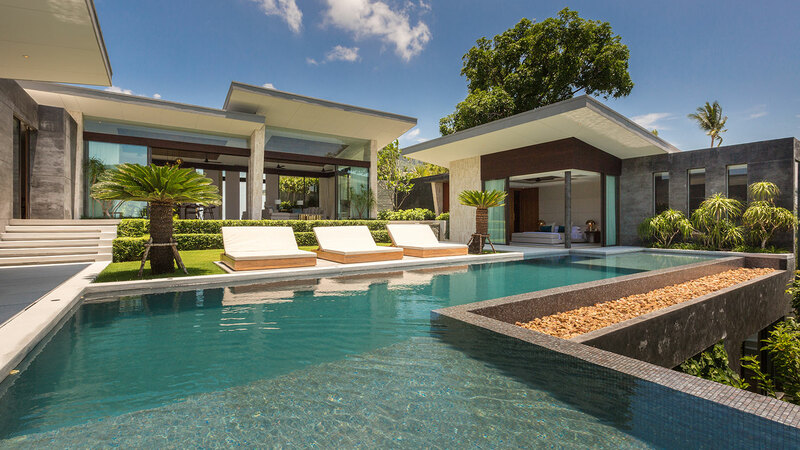 We have just had the most amazing week at your villa in Koh Samui with my family … I wanted to let you know how absolutely incredible both Renu and Bee were this week. I cannot speak highly enough of the entire experience – the villa is of course amazing but Renu and Bee’s thoughtful and friendly hospitality made it really special. They both went above and beyond for my dad’s birthday, organising a special dinner, cake, gifts and even fireworks! … We will definitely be recommending Celadon to our friends and I really hope one day we can go back to visit. Back from our holidays in Koh Samui, we just would like to tell you how great was our stay in your amazing Celadon Villa. We were especially fascinated by the pure design of your villa, the all open spaces, the huge infinity pool and the great sea view from everywhere in the house. Everything was furnished with taste and very clean. Renu and Bee where lovely and they cooked also very well. Your local reference book with nice beaches and restaurants addresses was very appreciated and allow us to discover a different Samui. We really had a great time there, but not enough to do everything! We hope to come back soon with friends and would to address you a special thanks to you. Just a short note to tell you what a nice stay we had at your villa on Koh Samui island. Our three children and friends were thrilled and our vacation in Thailand came to an end in a perfect way after 6 days in your splendid villa. We loved every bit of it, especially the tasteful decoration. Renu and Bee largely contributed to the success of our stay. They are very efficient and lovely people and their food was just wonderful. My partner and I spent the past week at your “retreat” Celadon in Samui. I just wanted to send you a quick email to say what a lovely place it is but also more importantly to say how wonderful Bee and Renu are. They really did look after us. I wish it wasn’t so far away from the UK! Thank you for making it possible for us to experience such a calm and peaceful environment which was greatly needed.